Refuelling of Natural Gas Vehicles (NGVs) is easier and safer than refuelling with gasoline or diesel – it takes about the same amount of time, but you don’t get smelly stains on your shoes or spills down the side of your vehicle. OEM bi-fuel cars often have the natural gas fuel inlet paired with the liquid fuel inlet. The process will differ only slightly, depending on whether you are using compressed natural gas (CNG), Liquefied Natural Gas (LNG), or a blend of hydrogen and CNG (HCNG). The refuelling nozzle simply clicks onto the receptacle on the vehicle and you are ready to fill. When the cylinder is full, the dispenser automatically shuts off and you are ready to disconnect again. With LNG or HCNG, it is usually necessary to wear gloves due to the extreme cold temperatures of the fuel (you don’t come into contact with the fuel but the equipment usually conducts the cold). Options for refuelling include public station, depot based and home refuelling. The main difference between each option is the volume and speed at which the fuel is dispensed and the means of paying for the fuel. Whether for OEM NGVs or vehicle conversions, CNG refuelling is safe and uncomplicated. Much like refuelling with gasoline or diesel, the driver pulls up at a dispenser, switches the engine off and then connects the nozzle to the receptacle. 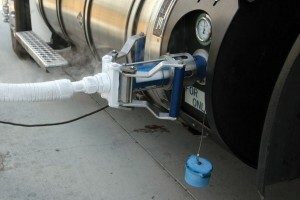 Some nozzles have an isolator fitted, which prevents the engine from being switched on while connected to the dispenser. 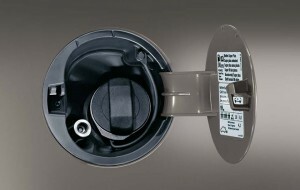 In some converted vehicles, the refuelling receptacle may be located under the hood or in the trunk. In most OEM vehicles though, the receptacle is located where the gasoline or diesel inlet is. Refuelling usually takes the same amount of time as a gasoline or diesel vehicle, though if demand is particularly high, a resulting pressure drop may extend this time a little. 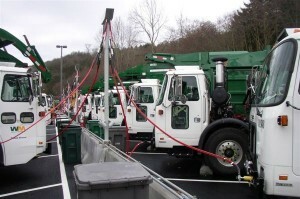 Public refuelling stations are usually supplied either by piped natural gas (just like at home), or by ‘tube trailers’. A station supplied by a tube trailer is part of a ‘mother-daughter’ system, where the fuel is compressed at the mother station and delivered via the tube trailer to the daughter station. Mother-daughter systems are usually used when piped natural gas is not available. If the receptacle on the vehicle and the nozzle on the dispenser do not match, do NOT use an adaptor to refuel the vehicle. Industry standard nozzles and receptacles have been designed with optimal safety in mind to prevent accidents. If an adaptor is used, safety can be compromised, particularly in relation to the high pressure these systems operate under. Adaptors are also known to have been used to allow LPG (propane) to be used on a CNG vehicle and vice versa. This is extremely dangerous and has resulted in loss of life and serious injury. Anyone witnessing these practices are urged to inform local gas safety authorities. Return to base fleets with downtime are ideal for slow-fill refueling systems that can fill multiple units concurrently. A depot based station usually services a limited fleet, though facilities are often shared with fleets or private vehicle owners that are not related to the depot. A depot based CNG refuelling system may be either a fast-fill or a time-fill (aka slow-fill) system. 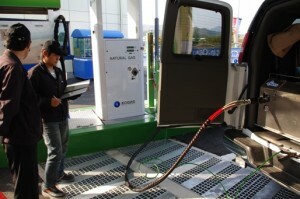 A fast-fill CNG system will fill a vehicle in a ‘normal’ time of around five minutes or less. A time-fill system fills the vehicle over a period of time, often overnight, and is usually used for vehicles that have extended periods where they aren’t operated – e.g. refuse trucks, courier vans, private vehicles, lift trucks, etc. The main advantage of a time-fill over a fast-fill system is that it usually has lower cost. Fast-fill systems require ‘cascade storage’ which essentially stores fuel at pressure which is then fed to the dispenser. With a time-fill system, the fuel is fed directly from the compressor to the vehicle’s on-board storage cylinder. This means less space is required for equipment and lower up-front and maintenance costs. A refuelling equipment or gas supplier can consult with depot operators to find the most suitable system for a particular depot. A vehicle refuelling appliance (VRA) is a small depot based unit designed to fill a limited number of vehicles, usually lift trucks or light commercial vehicles. Home refuelling is a relatively recent, yet exciting development for natural gas vehicles. As the name suggest, a vehicle is refuelled at home (or business), using a wall or floor mounted unit, in a garage or on an outside wall. The main advantages of home refuelling are convenience and low cost. With home refuelling, you not only avoid the hassle of having to visit a service station for fuel, but you also have the convenience of paying for your fuel along with your home or business natural gas bill. Though home refuelling is in its relative infancy, gas companies and vehicle manufacturers are often combining resources to make home refuellers available on low or no cost leasing packages. Training is required to safely handle cryogenic fuels. Liquefied Natural Gas (LNG) for transport is developing rapidly in many parts of the world. Because it is usually use for depot based fleets, it is generally only available from facilities with limited public access (usually depots that share facilities). LNG requires more infrastructure than CNG to produce and is often produced at one location and transported to another via a tanker truck for dispensing. Liquefied & compressed natural gas (LCNG) refers to a facility which produces or stores LNG but also dispenses CNG, produced by decanting it from the LNG storage. Hydrogen and compressed natural gas (HCNG) refers to a blend of hydrogen and natural gas, used because of its reduced emissions. HCNG is in its relative infancy and is generally only used with a blend of up to 5% hydrogen. Industry standards are being developed based on the experience of trial fleets.